In a connected world, as Internet users expect seamless and secure online experiences, DNS has become more difficult and complex to manage than ever before. The emergence of IoT devices and online threats leave businesses struggling to find the correct DNS strategy for their IT needs. Having the experience and DNS know-it-all in-house is nearly impossible, let alone having the dedicated resources to correctly manage and implement a sound strategy to meet today’s dynamic Internet demands. 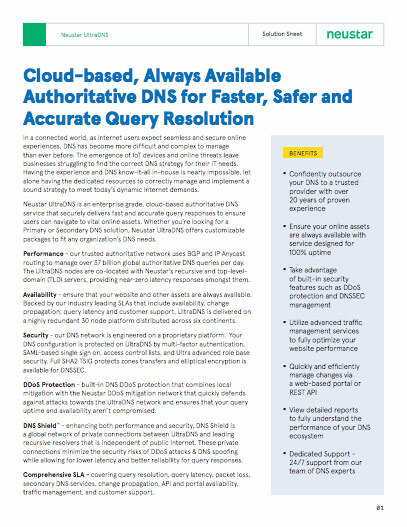 Neustar UltraDNS is an enterprise grade, cloud-based authoritative DNS service that securely delivers fast and accurate query responses to ensure users can navigate to vital online assets. Whether you’re looking for a Primary or Secondary DNS solution, Neustar UltraDNS offers customizable packages to fit any organization’s DNS needs. Performance - our trusted authoritative network uses BGP and IP Anycast routing to manage over 37 billion global authoritative DNS queries per day. The UltraDNS nodes are co-located with Neustar’s recursive and top-level domain (TLD) servers, providing near-zero latency responses amongst them. Availability - ensure that your website and other assets are always available. Backed by our industry leading SLAs that include availability, change propagation, query latency and customer support, UltraDNS is delivered on a highly redundant 30 node platform distributed across six continents. Security - our DNS network is engineered on a proprietary platform. Your DNS configuration is protected on UltraDNS by multi-factor authentication, SAML-based single sign on, access control lists, and Ultra advanced role base security. Full SHA2 TSIG protects zones transfers and elliptical encryption is available for DNSSEC. DDoS Protection - built-in DNS DDoS protection that combines local mitigation with the Neustar DDoS mitigation network that quickly defends against attacks towards the UltraDNS network and ensures that your query uptime and availability aren’t compromised. DNS Shield™ - enhancing both performance and security, DNS Shield is a global network of private connections between UltraDNS and leading recursive resolvers that is independent of public Internet. These private connections minimize the security risks of DDoS attacks & DNS spoofing while allowing for lower latency and better reliability for query responses. Comprehensive SLA - covering query resolution, query latency, packet loss, secondary DNS services, change propagation, API and portal availability, traffic management, and customer support. Our DNS network is engineered and designed to deliver 100% uptime and query resolution by continuing to operate in the event of an incident rather than failing completely. By utilizing redundancy in all aspects of the service architecture, including multiple network service providers with independent delivery paths, UltraDNS is able to deliver the most highly-available, fault-tolerant managed DNS network in the marketplace today.